Fused glass radiators make for the perfect home accessory for brightening up any room. Our glass is perfect for dressing up areas where radiators sit. They can sometimes give off a very ugly feeling, but with our fused glass radiators you can make them look a little more like art installations. Like all of our other fused glass products, we provide bespoke fused glass radiators for a truly personal touch. Perfect for when you want a stunning room with a lot of impact; the glass can be made bespoke to tie in with the colours of the room or to match with an existing piece of glass. Radiators can be overlooked and they aren’t often thought about when it comes to decorating your home. However, fused glass radiators can look absolutely beautiful and can really lift a room or area of your home. All of our bespoke fused glass radiators are made by hand and made from scratch. That allows the client to have full control over the design and colour scheme. It’s this personal touch that makes our fused glass art so sought after. Revamp your plain radiator today by commissioning your very own fused glass radiator. 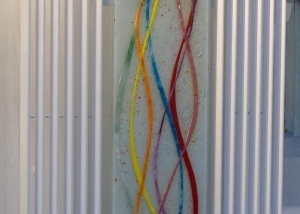 Browse our range of fused glass radiators to see examples of our previous work.